SCRANTON – Cards for Charity recently raised $2,600 for the Little Sisters of the Poor at Holy Family Residence. The successful fundraiser took place at the organization’s annual card party on Tuesday, Aug. 9, at the Elmhurst Country Club. 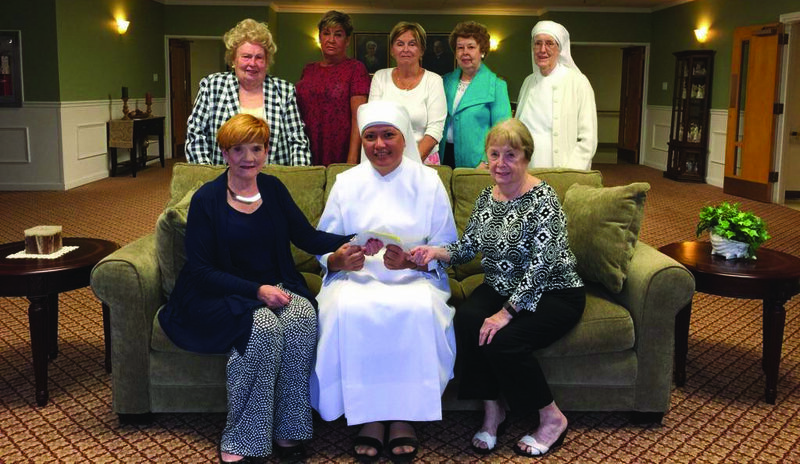 Pictured presenting the check to Mother Theresa Louisa, L.S.P., superior of the Little Sisters of the Poor’s Scranton community are seated left to right: Betty May, co-chairwoman; Mother Theresa Louisa; and Barbara Whitford, co-chairwoman. Standing left to right: Maureen Pesavento; Mary Lynn Scaccia; Rosemarie “Dolly” Martin; Joyce Tressler; and Sister Mary Augustine, L.S.P., administrator.